From social media to email, native advertising is everywhere. However, it is only within the past few years that B2C brands have managed to uncover the most effective distribution channels for native ads. Combined with the magic that is programmatic, brands can now reach their target audiences in a manner that effectively utilises ad spend while also serving consumers’ needs by delivering targeted content. That is why native advertising has proven so popular. 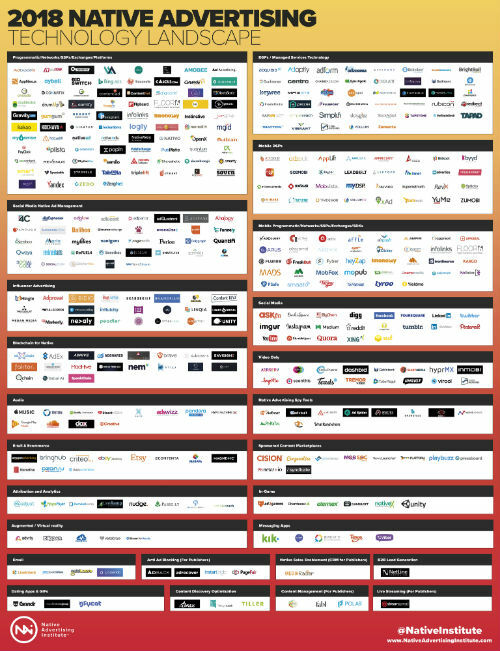 The recent 2018 Native Advertising Technology Landscape done by the Native Advertising Institute (NAI) also revealed that there are over 400 vendors in this space with several new categories having just been added this year. With nearly a 50% year over year increase in native technology vendors from 2017 to this year, the market is only expected to grow. Surprisingly, email is still one of the most underutilized distribution channels for native ads. How can B2C brands leverage email in native advertising? It is important to note that the NAI’s definition of native advertising always refers to paid media. So native advertising in this context never refers to advertising in your own content. Native advertising is paid advertising in which the ad is designed to match the feel, form, and function of the content of the media upon which it appears. Native advertising extends to all distribution channels including audio, video, AR/VR, social media, live streaming, in-app, and email. From SSPs, exchanges, and DSPs to sponsored content marketplaces, native advertising spy tools, and analytics, there are a host of tools that enable brands to manage and optimize their native campaigns on these distribution channels. As of 2018, there are just 4 vendors in the native email advertising space according to an infographic published by NAI. With a distribution channel that offers such a high potential for success combined with ad technology that is ripe for disruption, email is here to stay and it’s now supporting native. Interest in email advertising among B2C companies is at an all-time high despite the limited number of available vendors. New revenue stream for publishers. Publishers can directly monetize their newsletter audiences which collectively result in billions of daily impressions. Unobtrusive ads. Brands can advertise while protecting the user experience. Email is a high-performing channel. According to studies reviewed by the NAI, email open rates range between 15% and 27% with a CTR between 1,5% and 3,5%. Advanced targeting. Targeted ad selection is based on dozens of signals, including a mix of custom and industry standard demographic data, as well as, geo and device targeting. Passendo platform delivers rapid advertisement matching in just 300ms to 600ms. It is also important to note that most major display ad servers today work with Cookies or Device IDs as the central element in their tracking algorithms. Since these tracking opportunities do not exist in email, tracking is a challenge. In addition, the lack of a cookie or some other identifier makes it impossible to provide an ad selection for every email opened so that each user can be directed to the correct landing page. However, with the right technology, tracking is now possible. Passendo has become the first programmatic email platform to offer ad selection for every email open thus delivering full ad server functionally, frequency control, many types of campaign optimization, targeting, and much more. The Passendo email engine integrates with more than 10 major email service providers, including MailChimp, AGNITAS, MailUp, and other services, in order to track the opening and performance of ads. Across many newsletters, it is capable of tracking the campaign history for every single user while binding the correct impression and click to the right campaign. As a result, the performance of every placement and media can be tracked, optimized and reported on. As a programmatic platform, Passendo also automates the decision-making aspect of media buying by using real-time bidding to target specific audiences and demographics. Currently only image ads are supported, but they can be hosted by the Passendo platform, or hosted externally by a third-party ad server and still served optimized by Passendo. As B2C brands seek out new ways to reach today’s connected consumers, they are investing more of their budgets in digital advertising. Opel, the German car manufacturer, wanted to explore the potential goal of driving campaign success using native formats. With a presence in over 50 countries around the globe, Opel needed to increase brand recall and purchase intent for their new Insignia model. So Opel turned to Passendo to create a new experience to reach Danish consumers. At the time, email was a new distribution channel for Opel. The solution we devised involved Passendo's scalable native widget. The campaign was designed to increase viewability and time spend on product landing pages over a period of 3 weeks. We then optimized the campaign toward a well-defined business target group across premium business newsletters. The results? An average visit duration of 5 minutes and 54 seconds per page along with a 0,3% CTR on the distribution content. In 2018 alone, Opel has run more than 6 native campaigns with Passendo, all with better and better results. Our experience with Opel and other brands, such as Q8 International, the Austrian National Tourist Office, and Mercedes, have also allowed us to uncover several significant factors that ultimately contribute to campaign success. Looking at the outcome of Opel campaign in more detail, it is clear that every newsletter campaign must begin with high quality content. To that end, companies must work closely with the platform in developing distribution content that not only attracts the right audience, but also leads to engagement on the content destination. Brands must consider whether they have sufficient authority to influence consumers on a particular subject matter. Brands must also avoid misleading customers by allowing them to believe that the content is the publisher’s own rather than an advertisement. To that end, we chose to publish content in high quality newsletters such as Berlingske Business, Finans, and Investor for Opel's campaign given their acceptance by consumers as neutral, trusted consumer publications. While these publications match the demographics that Opel was seeking, the relationships between the advertisers and Opel were distinct enough to effectively present our client’s brand while giving consumers the freedom to engage. Lastly, advertisers must provide clear value in exchange for the consumer's attention. Whether the goal of the native ad placement is to entertain or inform, there must be significant value delivered in order to start building a relationship between the brand and the consumer. As a final note, Passendo is included in the 2018 Native Advertising Technology Landscape under the category of "Email." We believe that this is a great honour and it demonstrates our commitment to innovation. However, it has not distracted us from our goal of developing the world’s most exclusive premium editorial newsletter network and easy-to-use email advertising platform. If you’re ready to unlock your brand's ability to deliver meaningful content to your customers through email, we’re here to help. Learn more about Passendo's Publishing Solutions on our website or start a chat now.